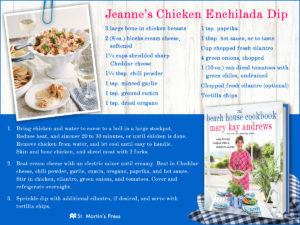 Jeanne’s Chicken Enchilada Dip–A Super Bowl Treat! This dip is named for my sister-in-law Jeanne, who is the appetizer queen. Jeanne never arrives at any family function without a cooler full of appetizers. One constant is this addictive cream cheese and chicken-based dip. And it is always the superstar at any get-together. In fact, it’s so beloved that she now brings a tub for each of her nephews to call his own. Covered and refrigerated, it stores well for up to a week. Be sure to choose sturdy tortilla chips to scoop up all the goodness! Chicken Enchilada Dip…and Me on TV! I just wrote this recipe down & plan on making it for superbowl,cannot wait to try it. Also am curious as to the price of the Beach house cookbook. I know I want one but thinking of birthday gifts for my sister Mary Kay book fans! Yay! I’m so glad. I hope your crew enjoys it. The list price for the cookbook is $29.99. 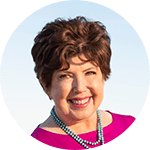 Click the buy links under the book cover on the sidebar of my website and you will see that it is already marked down at several retailers. You can pre-order it now at Amazon, for example, for under $20.